Most of the many thousands of letters written by or to Darwin are in the Darwin Archive at Cambridge University Library, but there are collections all round the world, in libraries and archives, and in private hands. Correspondence was a vital tool for Darwin in collecting the data to substantiate his theories, and for discussing those theories with colleagues; the letters are very much a part of Darwin's scientific archive. He lived at just the right time for an efficient postal service but too early to take advantage of any more ephemeral alternative, and, although there are some tantalising gaps, the letters survive remarkably intact and in most cases it is possible to follow the conversations that they represent. There is physical evidence of the importance to Darwin of the information in the letters that were sent to him: he made marks and notes in the margins, and often crossed through paragraphs as he used the information from them. He went back over some letters again and again as he worked on different subjects, scrawling on them in different coloured pencil, and cut them up so that he could file the pieces with relevant notes or stick them into his experiment book. Letters were dissected like specimens, every useful bit of information sucked out of them and then reincarnated in his publications. One task facing modern editors of Darwin’s correspondence is to reassemble the fragments of letters now distributed through not just one archive but many. Although about half of Darwin’s known correspondence is in Cambridge, the rest is scattered across the globe and around fiftynew letters are still discovered every year. 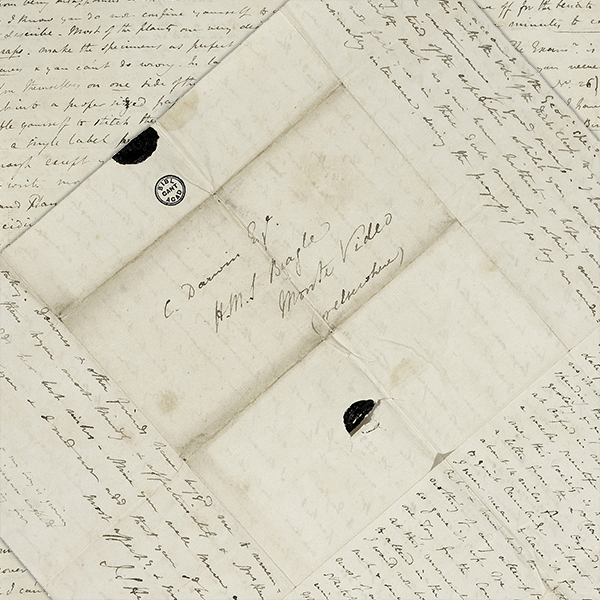 The Darwin Correspondence team accurately transcribe not only Darwin’s difficult handwriting but also the handwriting of the hundreds of correspondents he exchanged letters with throughout his lifetime, and research the content of the letters to establish the threads of the conversations, identify all the people, all the organisms and publications, and all the places. If we only provided scans, or only provided transcripts without any explanatory notes, the audience who could really make sense of this material would be severely limited. We make it possible to use the material as the basis for education at all levels, and for informed research by the general public. As an example of the research we do, fewer than half the letters have the date written on them, so before they can be put in the context of other material of the time we have first to establish that. Context is crucial to our understanding of what was going when the letters were written: Darwin is very easily misunderstood; a single phrase or a single letter out of context can become a minefield. To search the letters you can enter a keyword in the search box above, use the advanced search to the right of the search box for a more specific query, or browse all the Darwin letters in date order.